The ads have been placed in the Capitol South and Union Station Metro stops, which are the stops that bracket Capitol Hill, and in Metro cars on the red and blue/orange line trains, which are the main commuter trains down to the Hill. In other words, they've been made to be the morning reading of the people most engaged in the health reform debate right now — and if you think those folks are not thinking about healthcare spending and the growth of antibiotic resistance, well, umm, oh never mind. For statistics and arguments, along with more images — cows! chickens! pills! 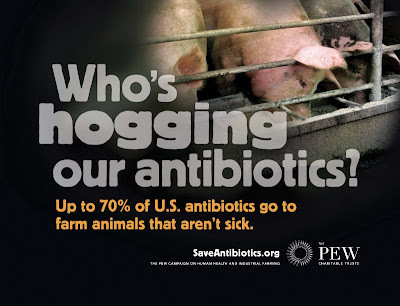 — go to the site of the commission's campaign, Save Antibiotics.